It’s St. Joseph’s Day – What Does It Tell Us About Housing Trends? Last week I can across Sanette Tanaka’s WSJ column “Spreadsheet” titled “Bless Our Happy Home Sale” that talked about the tradition regarding St. Joseph. I waited to blog about it until today since March 19th is actually St. Joseph’s Day (BTW: who is getting any work done this week with 3/17 St Patrick’s, 3/18 March Madness brackets and now this?). I previously wrote about this here in September 2005 and in October 2007. Traditionally, Joseph, the husband of Mary, is hailed as the patron saint of home and family. 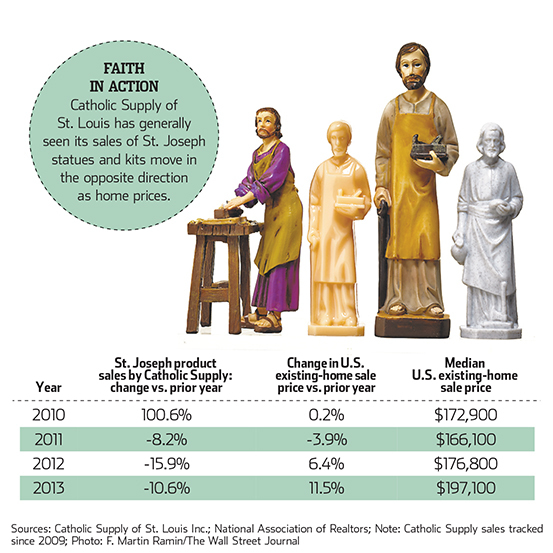 Some believe that burying a statue of St. Joseph in the yard helps sell a house. Bury the St. Joseph statue upside-down in your yard, facing toward the house listed for sale. The Seller digs up the statue and puts it in the new home in a special place. The last 4 years of statue sales show a pattern consistent with NAR’s existing home sale pattern with the housing market rebound beginning in 2011.
Who says housing trend analysis is devoid of emotion. Got it? Comments Off on It’s St. Joseph’s Day – What Does It Tell Us About Housing Trends?